Now that the hustle of getting ready for our return is over, I have time in the evenings to sit and knit a bit. As you can see, I have completed the center area of modular diamonds, and am now working around the edging. Or I was… More on that below. I am trimming the thing out into a full rectangle, filling in the missing edge half-diamonds and completing it with an edging. 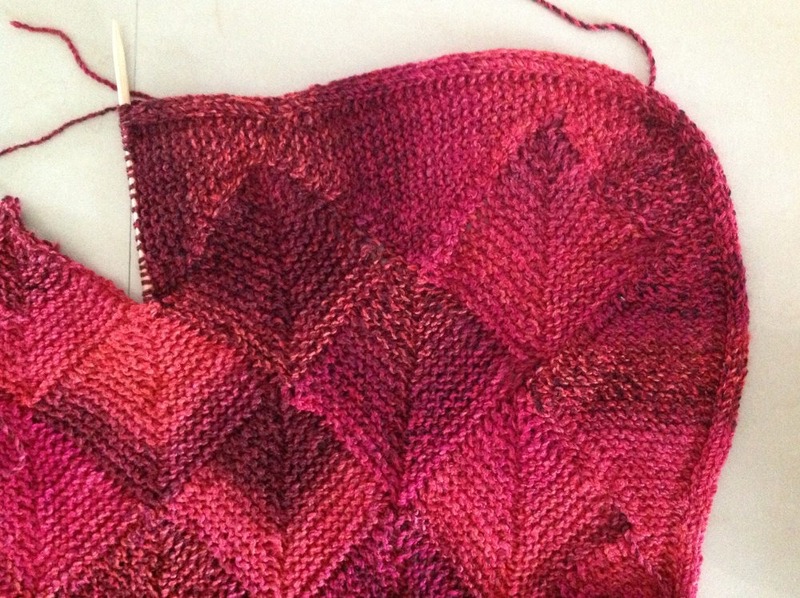 I’m winging it, but have some notes if the world thinks it really needs yet another free pattern for a modular diamond throw. If you are part of that world, please let me know. It’s particularly useful to create a “Chanel-look” professional detail on the fronts of cardigans. Buttonholes can be introduced between the edge and the main body, too. Or it can be used to create a casing for a drawstring or elastic, on the tops of bags or skirts. It can also be used on both sides of a narrow strip to create a firm strap, either to use as-is, or after fulling. (I posted about this almost 10 years ago). 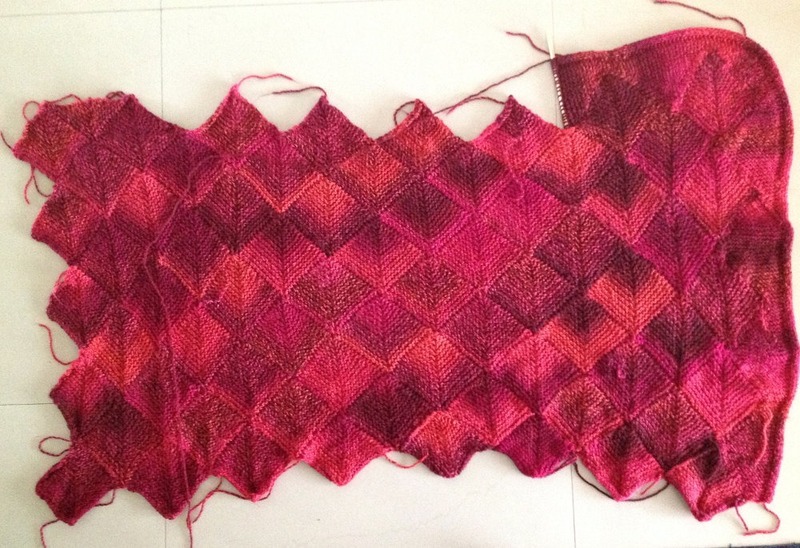 Row 1 (wrong side row): Work your project as usual until you get to the last four stitches. Bring the yarn to the front of the work. Leaving the yarn alone, slip the next four stitches as if to purl, transferring them one at a time from the left to the right needle. Row 2 (right side row): Just like when working I-cord, knit the first four stitches, making sure to pull the yarn very tightly to create the rolled edge effect. Then work the rest of the row as usual. Now, what’s this about not quite working the edging on this project? I had started it by adding five extra stitches of width on top of eking out my edge triangles, supplemented by a four-stitch rolled casing. That’s nine stitches per row extra. 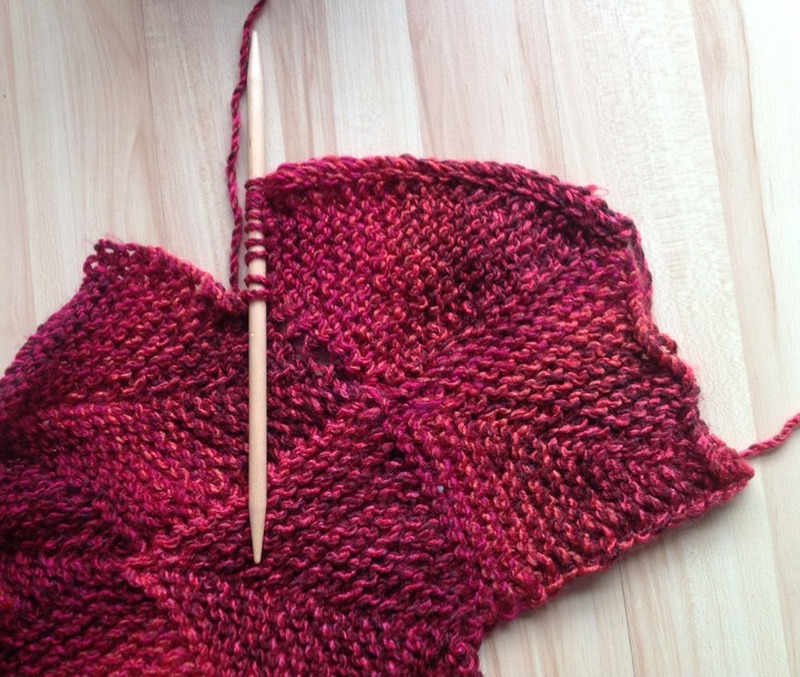 I got all the way around the corner, having worked that out, too, using short rows. Then I looked at how much yarn I have left – a little over 1.3 balls. It was highly probable that I’d run out before getting all the way around the blanket. With no way of getting more Marble here in India, I had to rethink. If I still don’t have enough yarn, the next possibility is to rip back some of the center diamonds and make the total piece smaller. But because that’s worked on the diagonal, doing so will be a major pain. Here’s hoping my quick fix is enough. Clicked on your blog on impulse, and here you are – for now. It’s good to see (read) you again. Didn’t get to the W&W closing sale – it seemed very sudden. It was sudden. And a bit traumatic. I helped out when I could, but it was sad to see the Shop Family scatter. Another possibility is to change your needle size. That saved me when I was a few ounces short of yarn to edge a scarf. Excellent idea! So long as gauge mods don’t affect fit (blankets don’t have to fit anyone), tinkering with needle size to save yarn is a good option.